John Boehner, the "RINO King" and Speaker of the US House of Representatives, has announced that he is stepping down. This is under intense pressure from the Republican rank and file who in turn are under pressure from their conservative base to defund Planned Parenthood, in the wake of recent scandals. It's probably fair to say that the Republicans are eager to rediscover their purported conservatism as the 2016 election looms near. John Boehner's natal birth time and the time of today's announcement are unknown to me, but there's still plenty of data to pick over when we look at Boehner's astro-weather for today. Transiting stationary Pluto conjunct Boehner Venus; transiting Venus conjunct Boehner Pluto: the death of the "gravy train". 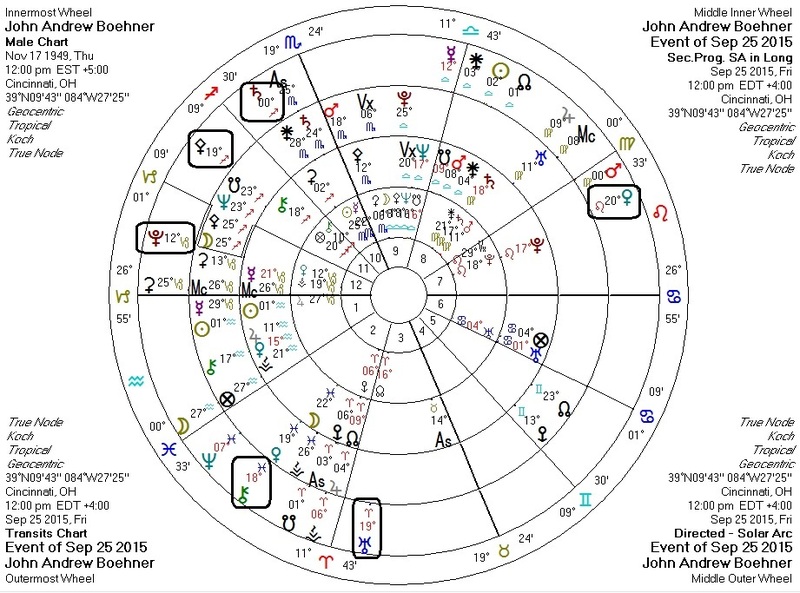 Transiting Saturn conjunct (waning) Boehner Sun: the end of a year or so of great pressure. Transiting Uranus, Chiron, and Pallas aspecting Boehner Pluto: unexpected developments, injury, and ethics/strategy triggering (a type of) death. Solar arc Mars square Boehner Pluto: again with the death thing. Perhaps also representing a challenge against one's own Plutonian power. Repuglicans, will you please pick better leaders in the future?